I hash tag this phrase quite frequently. Ever since becoming a mom, I’ve been pretty obsessed with safety, whether it be childproofing your home or correctly installing a car seat. My thought is, you made this perfect baby, so wouldn’t you want to do everything in your power to protect them? The amount of incorrect installation of car seats and incorrect buckling of children in car seats astounds me. Sometimes I get into thinking that it’s ignorance, but it always leads back to one word – knowledge. I just think that a lot of people just don’t know how to properly install a car seat. I feel like it’s becoming more and more clear to me about what I’d like to do. My goal this year is to register to become a certified CPST, which is Child Passenger Safety Technician. I’d say the worst things that I’ve seen are during the winter months. That’s when the JJ Cole BundleMe covers come out to play, along with the fluffy strap covers, and those damn snowsuits. Did you know all of these are unsafe for car seat use? If your car seat didn’t come with an insert or strap covers, it’s not crash-tested with your car seat. In fact, it actually voids the warranty of your car seat in the event of a crash. Also, your child wearing a snowsuit ensures that there isn’t a tight fit for the harness, and in the event of a crash, they’ll slide right out of the harness and through the window. Look it up. It’s happened. 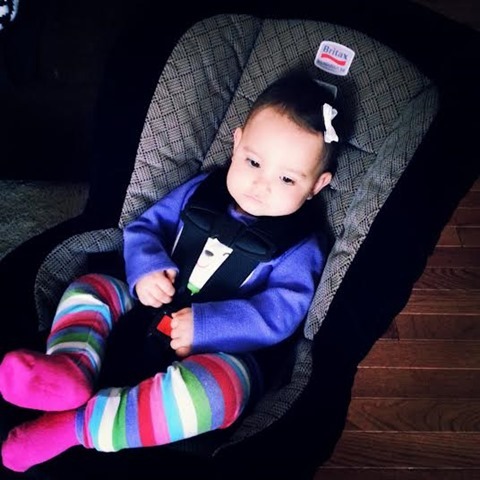 Did you know that to get the tightest install possible, you should be sitting on the car seat base, or in the car seat itself while latching it? Yes, that means you. YOU climb into your CHILD’S car seat or on the car seat base of infant seats, and put a solid amount of weight on it to get the tightest install. Your child’s car seat shouldn’t move an inch when you’re done. Bottom line: If your child’s car seat moves when you put them in the car, you’re doing it wrong. Did you know that the chest clip isn’t a stomach accessory? No, really. They actually put the chest clip there to protect your child in the event of a crash. So, if it’s not at arm pit height, it does absolutely nothing to protect them. “The chest clip is a pre-crash positioning device, meaning it does its most important duty before a vehicle crash occurs. The clip, when used properly, keeps the car seat harness in the right place against the child’s shoulders, so that crash forces are distributed over the strongest parts of the child’s upper body.” Also, tighten those harnesses every time you buckle your baby in! If they can lean over and sleep on the side of the seat, it’s not tight. Did you know that rear-facing until age 2 is becoming the minimum age in some states? That should say something right there. Also, as many parents get confused, most states have the same law: Forward face when child is one year old AND 20lbs. Not one or the other. I would absolutely love to teach parents how to install their car seats safely, and teach them proper buckling. I had a friend who had recently offered to re-install a friend’s car seat because it wasn’t installed properly, and that week, her friend’s car was T-boned. Emergency crews on site said, “Thank goodness that car seat was installed correctly.” She literally saved that little girl’s life. If I could correctly install car seats, promote proper buckling and save just one life, that would be enough for me. Teach me! Every single time I buckle Jennie in, I get stressed out that I am not doing it right.